It’s a sad but true fact. 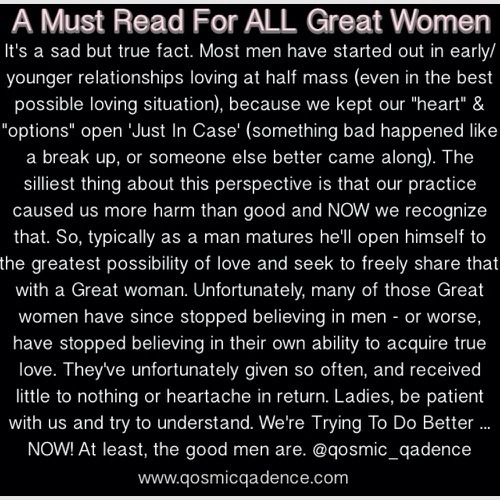 Most men have started out in early/younger relationships loving at half mass (even in the best possible loving situation), because we kept our “heart” & “options” open ‘Just In Case’ (something bad happened like a break up, or someone else better came along). The silliest thing about this perspective is that our practice caused us more harm than good and NOW we recognize that. So, typically as a man matures he’ll open himself to the greatest possibility of love and seek to freely share that with a Great woman. Unfortunately, many of those Great women have since stopped believing in men – or worse, have stopped believing in their own ability to acquire true love. They’ve unfortunately given so often, and received little to nothing or heartache in return. Ladies, be patient with us and try to understand. We’re Trying To Do Better … NOW! At least, “The Good Men Are”.